The unique 3N1-20 bag provides ultimate freedom and allows for three carrying options in one while morphing from sling to backpack and back again fast and easy by use of its quick release buckles.The following presentation will show PHOTO equipment however please be advised that this bag is supplied with modular dividers that can easily be set up to also fit small video camcorders with accessories. The 3N1-20 sling backpack features a unique TST RIB structural protection for a D/SLR with battery pack & mid-range zoom lens attached as well as, 3-4 lenses, flash + personal gear. The large top compartment will hold personal accessories or additional gear. Three different positions allow you to carry the bag according to your needs. Each sling position allows you to carry your equipment and have fast access while shooting. 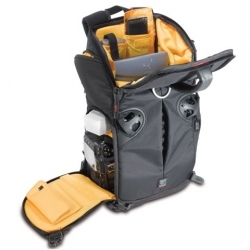 In backpack position you can comfortably carry your equipment for long distance walking when needed. The included chest belt and balancing hip strap helps take the load of your heavy equipment off your shoulders. This position allows you to have the benefits of the comfort of carrying as a backpack along with the ability to swing around the bag easily for quick drawing of your camera. Simply release one of the buckles and swing around to draw and back again. When shooting, leave the quick draw tab sticking out of the camera compartment to easily open. Put tab inside inside bag to fully zip the side compartments for a more secure opening. The entire main compartment is completely customizable with the divider system. If you prefer to use it as a right sling then configure the bag with camera grip on the left side and vice versa. This will allow you to grab your camera easily on the side you prefer. Lenses and accessories less used can be situated in the rest of the bag. The large top compartment will hold personal gear or additional gear, and the internal pockets and mp3 player pouch will allow you to organize your personal effects as efficiently as your photographic gear. Two external pockets allow quick zippered access to accessories without opening the main compartments. The 3N1-20 is compatible with the standart insertrolley (sold separately)if wheel along transportation is needed or can be placed over an existing trolley handle. Three varying sizes as well as as set of 3N1's with laptop compartment allow you to select which bag is right for your kit.